Do you not know that all of us who have been baptised into Christ Jesus were baptised into his death? Therefore we have been buried with him by baptism into death, so that, just as Christ was raised from the dead by the glory of the Father, so we too might walk in newness of life. These words from St Paul, proclaimed each year at the Easter Vigil, remind us of the centrality of baptism to our Christian faith. Baptism draws us into the Paschal Mystery – that is, the mystery of Christ’s passover from death to new life. It is little wonder, therefore, that the rituals of the Easter season draw particular attention to our baptism. We renew the promises of baptism on Easter Sunday. Each Sunday, we are encouraged to put aside the usual Penitential Act and instead participate in the sprinkling of blessed water. Baptism is the primary sacrament by which we are freed from sin, again through sharing in Christ’s death and resurrection. 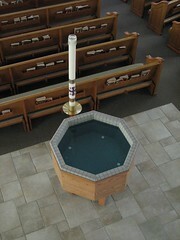 Our new baptismal font also serves to remind ourselves of the centrality of this sacrament as our entry to the Church (hence why every entrance now leads to the font); a Church that celebrates the Paschal Mystery every Sunday and is brought to the fulfilment of, and sustained in its Christian life through the eucharist to which baptism leads. Blessing ourselves directly from the font as we enter the church helps make this all the more powerful. 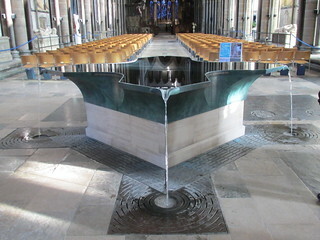 While on the topic of the baptismal font, we have received some enquiries about our new font since it was installed. While the bowl can be removed for emptying and cleaning, it is not possible to accidentally tip it over. Keeping the font clean is important, and the water is replaced and the font cleaned with disinfectant on a regular basis. The green patina that has developed on the bronze in places is a natural result of contact between the bronze, water and air. It also happens on similar metals such as copper (think of old copper pipes, or the Statue of Liberty, which also gets its green colour from the natural patina that has developed on the copper over time). Today we celebrate Pentecost Sunday and the giving of the Holy Spirit to the apostles. As Catholics, we first receive the Holy Spirit at Baptism. St Peter calls on those who witnessed the twelve speaking in tongues to “be baptised… and you will receive the gift of the Holy Spirit” (Acts 2:38). Our Baptism is quite literally confirmed by the bishop (or his representative) in the Sacrament of Confirmation – it is from the historical action of the bishop confirming baptisms across his diocese that this rite developed. In this sacrament, we are “enriched with a special strength of the Holy Spirit” (Catechism of the Catholic Church, no. 1285). By signing us with the gift of the Spirit, confirmation makes us more completely the image of the Lord and fills us with the Holy Spirit, so that we may bear witness to him before all the world and work to bring the Body of Christ to its fullness as soon as possible. Fr Paul is currently sharing with everyone the design concept for the renewal of our church. 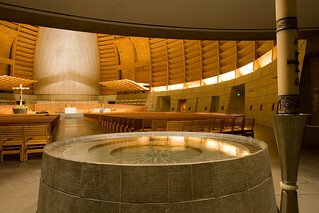 One feature of this design is the provision of a new fixed, dignified space for the celebration of baptism. Baptismal fonts have been formed in different shapes over the course of history, each revealing something of our belief in baptism being a sharing in the death and resurrection of Christ. Round baptismal fonts are symbolic of the womb and remind us that through baptism, we are reborn into new life with Christ. Square or rectangular fonts seek to evoke the image of the tomb; they teach us that sharing in the resurrection of Christ comes only through sharing in his death. Cruciform (cross-shaped) fonts also illustrate how our sharing in Jesus’ death leads to salvation and glory. 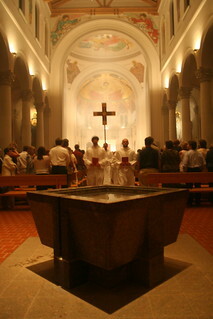 Another shape that has a long tradition in the design of baptismal fonts is the octagon. The eight-sided shape is used as a direct reference to the eighth day which is Sunday, the Lord’s Day – the day of the resurrection. Our proposed octagonal-shaped font with round bowl will be fabricated in stone and metal to specifically relate to the original design plans for the church, and to the proposed design of the altar and ambo. Mother Church earnestly desires that all the faithful should be led to that full, conscious and active participation in liturgical celebrations which is demanded by the very nature of the liturgy. Such participation by the Christian people as “a chosen race, a royal priesthood, a holy nation, a redeemed people” (1 Pet. 2:9; cf. 2:4-5), is their right and duty by reason of their baptism. Whenever we enter the church, we bless ourselves with holy water. It reminds us of our baptism; a baptism that initiates us into the death and resurrection of Christ and into the Christian Church. The liturgical celebrations of the Church are celebrated in the name of the Trinity – Father, Son and Holy Spirit. Only those of us who are baptised can participate in them fully. The blessing of ourselves with water becomes an even stronger and more obvious reminder of our baptism when we bless ourselves directly from the baptismal font. We will be led directly to the proposed location of the baptismal font from whichever door we enter the church. From here, we will bless ourselves with its water, reminding ourselves of our baptism; the same baptism by which we have not only the right, but the duty to participate in the public worship of the people of God. Locating the baptistery at the intersection of the church aisles will make it clearly visible, and provide space for the celebration of the sacrament, and for those participating in baptism celebrations to sit to stand near the font (aided also by some reconfiguration of seating). At the Easter Vigil, the elect will be baptised in the midst of the Church into which they are being initiated; the Church that shares in Christ’s death and resurrection and thus also in the priestly duty of offering sacrifice and praying to God for the needs of humanity. Baptism is the first sacrament, the way by which people enter the Catholic Church. 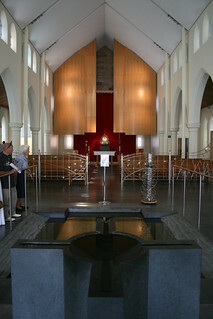 The font will be clearly visible from each entrance, and those entering the church are led directly to the font. A clear relationship between the font and the church entrance expresses the fact that this sacrament of Christian initiation brings the baptised person into the Church which celebrates the liturgy.